You can use a location or its corresponding business entity (such as a corporation) as the billing provider for claims that are submitted to carriers for procedures performed at that location. 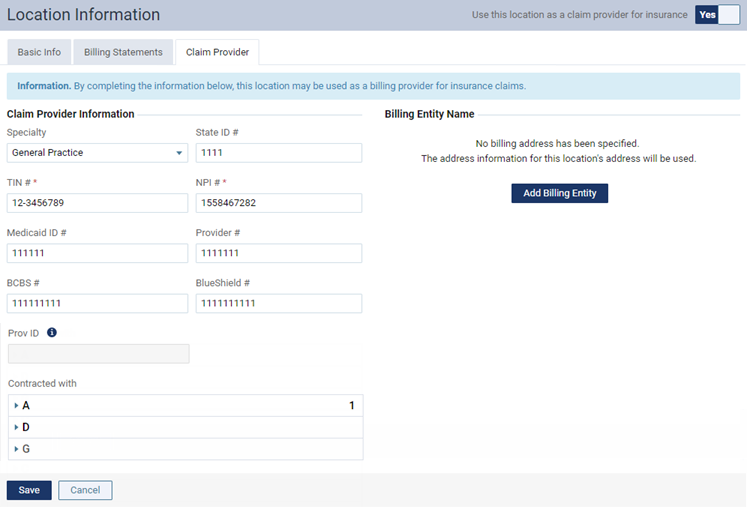 On the location's Location Information page, set the Use this location as a claim provider for insurance switch to Yes. Click (or tap) the Claim Provider tab. Specialty - The type of dentistry or specialty that is practiced at the location, such as General Practice, Endodontics, or Pediatric Dentistry. IDs - The State ID (state license number), TIN # (or SSN), NPI # (for electronic claims), Medicaid ID #, Provider #, BCBS # (Blue Cross/Blue Shield number), and BlueShield # . Contracted With - As needed, expand the sections (for example, A, D, and P) to view insurance carriers with names that start with those letters or numbers, and select the check boxes of the insurance carriers that this provider has a contract with to bill procedures. Important: Each time you add an insurance carrier to your organization's database, for all users and locations who are providers, you must return to this Contracted With section and manually specify that those providers and locations are contracted with that carrier. To set up a business entity (such as a corporation) as a billing provider for services rendered at this location, click (or tap) Add Billing Entity. Then, type the name, address, and phone number of the entity. Note: To remove the entity, click (or tap) the Use location info address link. 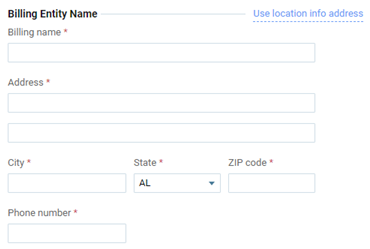 On the location's Insurance Claim Defaults page, under Billing Provider, select Specific Provider or Provider of Procedures, and then select the location name or entity name.